3 Nov 2018 — Gun-carrying civilian groups and border vigilantes have heard a call to arms in President Trump’s warnings about threats to American security posed by caravans of Central American migrants moving through Mexico. They’re packing coolers and tents, oiling rifles and tuning up aerial drones, with plans to form caravans of their own and trail American troops to the border. The military report provided no further details about the alleged thefts. Manuel Padilla Jr., the top Border Patrol official in the agency’s Rio Grande Valley sector, the nation’s busiest for illegal crossings, said he has not issued any instructions to agents in the field or to landowners whose properties are adjacent to the river. But he plans to meet with community members in the coming week, he said, to address their concerns. “But they’re doing that on their own,” Padilla said. McGauley said that in addition to weapons and camping gear, his group will have night-vision goggles and aerial drones with thermal sensing equipment, capable of operating in darkness. He emphasized that the group would report any suspicious activity to authorities and would heed any instructions from Border Patrol agents or military personnel. “People on the [Rio Grande] have been calling us,” Vickers said. His group is in a “holding pattern,” he said, adding, “We can have 100 volunteers in a hot area in four to eight hours. “We’re ready to move,” he said. Others in South Texas are less enthusiastic. Lucy Kruse, 96, said immigrants often stop on her property as they walk through the bush country, sometimes breaking into a small cabin to sleep. Her family’s ranch lies amid the thorny mesquite brush, cactus and tawny dry grass 80 miles north of the border. As the migrant caravans head north, she and other landowners in the area worry that the number of trespassers walking through their ranches will increase dramatically. But many say the militias coming to the area also pose a threat. Joe Metz, 80, lives in what looks like a pastoral tropical paradise near Mission, a town of 84,000 in the Rio Grande Valley. Tall, green sugar cane grows beside the wide river, and citrus trees dot the sandy small hillocks away from the banks. The Rio Grande is less than a mile from Metz’s living room window, and a section of border wall crosses his property. He has watched for years as border-crossers ford the river and walk onto his land, their first step on American soil. The wall has slowed the flow significantly, he said, but between 50 and 100 people a day still cross through the farm next door. He worries that the caravan, which includes many women and children, will surge through the area, but he doesn’t want armed vigilantes on his farm. But the heir to the state’s largest and most influential ranch disagrees. Stephen J. 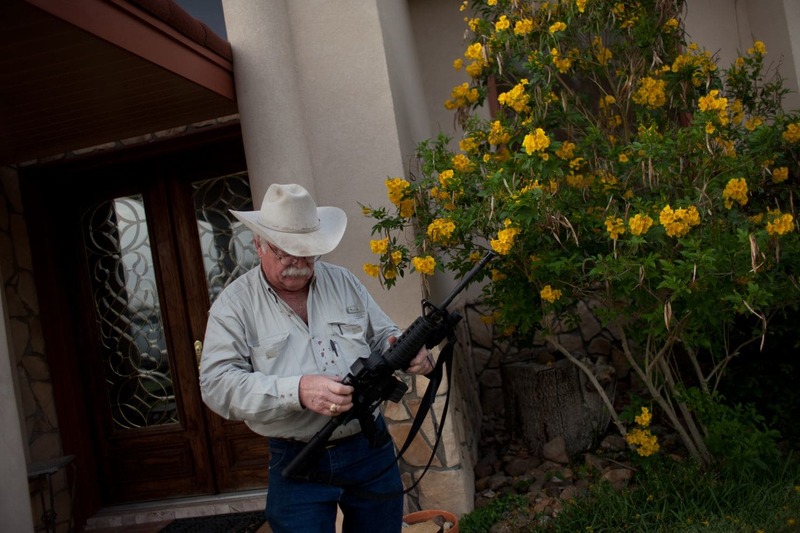 “Tio” Kleberg, who has lived most of his life on the 825,000-acre King Ranch outside of Kingsville, said that he will allow militia groups on his ranch, which is larger than the state of Rhode Island. “I think if the [caravan members] get across the river, they need to be caught and sent back,” said Kleberg, who wears a bushy handlebar mustache and chews an unlit cigar. “Once they get on U.S. soil, they need to be stopped and detained. We don’t have enough Border Patrol, ICE and Highway Patrol to handle them. If we get 2,000 or 3,000 people, we will need the militia,” Kleberg said.